The fun doesn't have to end on Thanksgiving Day! Once again, we are also holding a food drive benefiting Alameda County Food Bank and are encouraging all participants (including little turkeys) to bring at least one canned good on race morning. Want to make your Thanksgiving Epic? 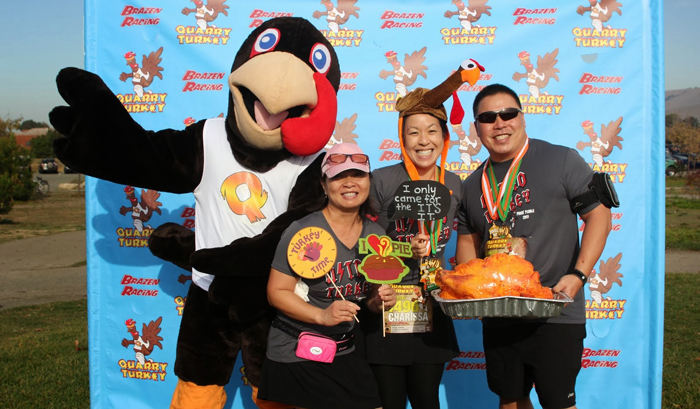 Sign up for the Double Turkey Challenge! Participate in both of Brazen Racing's Thanksgiving events (Nitro Turkey on Thanksgiving Day and Quarry Turkey on Saturday, the 30th) and you will be eligible to receive a special connector medal that unites the medals from both races to create a mega medal. To be eligible, you have to participate in races on both days (in person or remotely). No special registration required.